Lieutenant Blake Wells - 2B2 has lived in Bear Lake County for most of his life. He is a graduate of Bear Lake High School. Officer Wells started his career in Law Enforcement when he attended the Idaho State University law enforcement program. He graduated from the program in May of 2001. He was hired in June of 2001 by Custer County Sheriff's Office located in central Idaho, where he worked as a dispatcher and jailer. 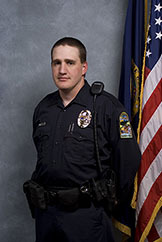 Officer Wells was hired by Montpelier Police Department in August of 2002 as a patrol officer. Since then he has attended several trainings; including, detective & new criminal investigator course, the sergeants academy, incident command, and breath alcohol testing specialist course. Officer Wells is happy to be working for the Montpelier Police Department and is looking forward to serving the citizens of Montpelier for many years to come.